Here is another brand that I am a huge fan of- Enjoy Life Foods. At the moment these are my favorite chocolate chips. They are a trusted brand for me and the only brand I purchase my chocolate chips from. I usually use the dark chocolate chips. They are free from common food allergens. If you are looking for a dairy-free, vegan option for chocolate chips this is the brand I recommend going with. A lot of talk about ghee these days! Ghee is a clarified butter with all milk solids removed. It is a dairy-free option to butter and this can replace your current butter or cooking oil with a 1:1 ratio. I use 4th & Heart ghee for my cooking and my baking. The smell of a ribeye steak cooking in some ghee is divine. I will never turn my back and go to regular butter again. Ghee not only tastes better but it also has some health benefits as opposed to butter. This variety pack includes regular ghee and a vanilla ghee, which would be great for your next baking project! If you are looking for a lower carb pasta that is gluten-free and high in protein look no further than Banza! I have been using Banza quite often in my pasta dishes and it is one of my favorite pasta that is gluten-free. You can check out the macaroni salad that I made with Banza HERE. I whipped that up for family and even though it was gluten-free the pasta salad was a smashing success. Pro tip: undercook your pasta just a tiny bit. I always do a minute or 2 less than the suggested time on the box. I also give my pasta a rinse before serving. If you are interested in making a vegan and paleo cheesecake raw cashews are a must! Nut Cravings has pretty reasonable prices. Raw cashews can be quite pricey! When the raw cashews (soaked overnight) are mixed with a bit of coconut milk and lemon juice you end up with a faux cheesecake filling. I honestly prefer my raw paleo cheesecakes over traditional nowadays. Coconut cream is essential for paleo or vegan baking. If you are in need of a dairy-free whipped cream the best way to go is to use Thai Kitchen coconut cream. You simply refrigerate the can overnight and then scoop the solids out of the can (no water) and then use your whisk attachment on your stand mixer. Looking for a healthy alternative to coffee creamer? Perfect Keto MCT Oil Powder stirs in nicely to your morning coffee. This will give your brain and body a much-needed boost to start your day. 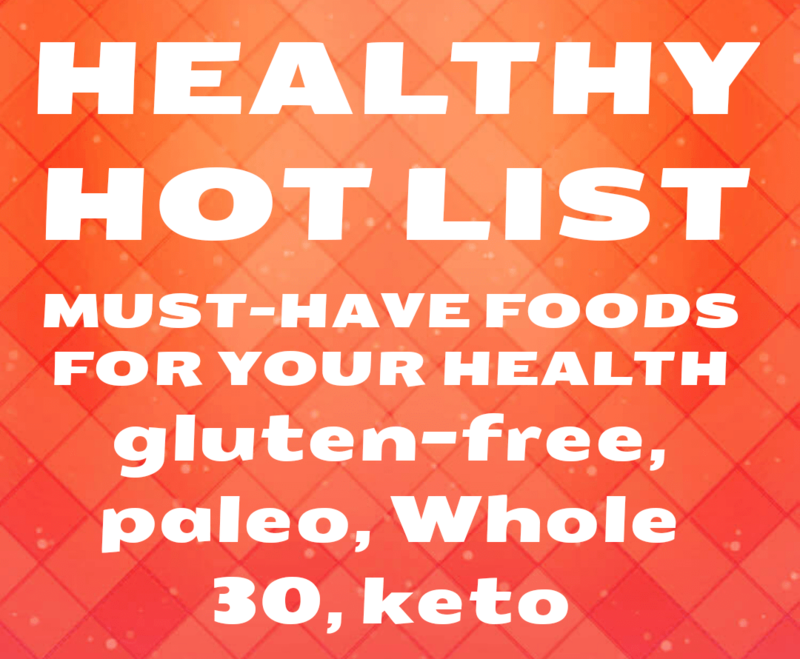 What items have you tried from this Healthy Hot List and what are your thoughts? Leave me a comment and let me know. This entry was posted in Health and Wellness, Shopping Guide, Tried It Out Tuesday and tagged 4th & Heart, antioxidants, avocado, avocado oil, avocado oil mayo, Banza, butter, cacao, cacao nibs, cashews, cauliflower, cauliflower crust, Caulipower, cheesecake, chickpea pasta, chocolate, chocolate chips, clarified butter, coconut cream, coffee cream, dairy free, enjoy life, enjoy life foods, ghee, gluten free, glutenfree, health food, healthy food, Healthy Hot List, keto, low carb, MCT Oil, Nut Cravings, paleo, perfect keto, primal kitchen, snack, superfoods, Terrasoul, Thai Kitchen, vegan, whipped cream, whole 30. Bookmark the permalink.